A colleague and I visited the London office of DNV to work on a project with aviation safety specialists based over there. For some reason DNV London had a ship dry docked in their front yard. 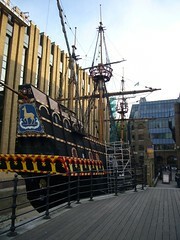 It's an authentic replica of the galleon in which Sir Francis Drake sailed around the world in 1577 – 1580. DNV and Maritime go back a long way, so it's not that strange after all.